Anaphylaxis refers to the most serious and most dangerous kind of allergic reactions. These reactions can be so severe that they are normally considered life threatening. An allergic reaction occurs whenever your immune system produces antibodies to defend against any harmful substance. Whenever these substances provoke an allergic reaction, they are known as allergens. The chemicals that are produced by these antibodies may produce mild allergic symptoms ranging from watery eyes to a runny nose as a means to flush out any unwelcomed substances. Anaphylaxis occurs whenever your body has a very severe allergic reaction. A patient’s blood pressure may abruptly drop, the bronchial tubes may narrow, a shortness of breath is experienced, and a person may pass out or even die. This sort of reaction can occur within minutes, possibly even seconds, at the moment of exposure to allergens. It is fortunate, however, that anaphylaxis is a very rare type of allergic reaction and it is one that can be easily prepared for. If you are aware of your allergic responses, then you can avoid your allergens and have medications with you at all times so that there is no delay in treatment if and when you experience anaphylaxis. The airways become constricted, and this results in wheezing and the inability to breathe in fully. This may include swelling within the tongue or throat which may impede air from entering your lungs. A person may go into shock as a result of the sudden drop in blood pressure. The heartbeat may begin to slow or greatly increase. Dizziness or fainting may come as a result of the lack of oxygen or low blood pressure. The skin may break out in hives and begin to itch. 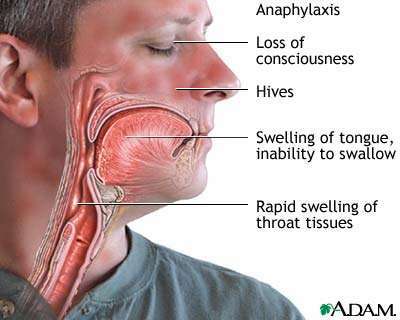 The cause of an anaphylactic reaction is not very clear; one can go to their doctor with symptoms of anaphylaxis and they may not be able to identify what exactly caused it. Your doctor may go through a list of the most common allergens, which include drugs and penicillin, since many people are allergic to it. One other common source of allergens would be found within food such as peanuts, milk, shellfish, eggs, and fish. There are also several people who are allergic to latex and must do all they can to avoid it. Whenever one experiences symptoms of anaphylaxis and have no idea what could have caused it, they must rush to the doctor immediately so that their doctor can pinpoint what caused the allergic reaction.